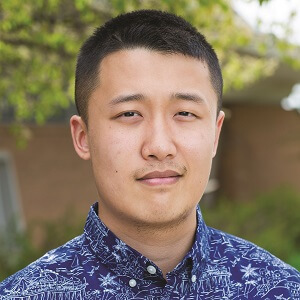 Ge Zhu (’17) struck up an interest in research during Dr. Bill McMillan’s artificial intelligence class and Dr. Elizabeth Peckham’s pharmacology class while working toward his bachelor’s degree in computer science at CUAA. Now Zhu is taking the next step in his educational journey and has his sights set on a career in biomedical engineering. next step in his educational journey and has his sights set on a career in biomedical engineering. Zhu, who is currently studying biomedical informatics at Stanford School of Medicine in California, is combining the foundation he acquired from Concordia, the intellectually challenging environment of Stanford, and the entrepreneurial spirit of Silicon Valley to catapult himself toward his goals. Through the Stanford program, Zhu is working on a data science project in lung cancer care delivery, and has daily interactions with faculty and scholars around the world as he learns from experts in the field. He will complete his graduate degree in August 2019 and hopes to continue his education in a medical scientist training program, where he’ll apply computational sciences to clinical medicine. Ultimately, Zhu says he sees himself serving as a diagnostic radiologist in a university hospital, running a research lab in biomedical engineering.